Material: Nylon, durable, soft and skin-friendly. Pack of 12pcs colorful cat collars with bell, 1cm width, fit cat neck 24cm to 34cm. The high-quality nylon adjustable collars with a color coordinated jingle bell that can be removed. Collars can be embroidered with pet’s name or phone number by masters. 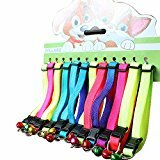 This entry was posted in Uncategorized and tagged 12pcs, Adjustable, bell, Collars, Colorful, Nylon by One Boutique. Bookmark the permalink.